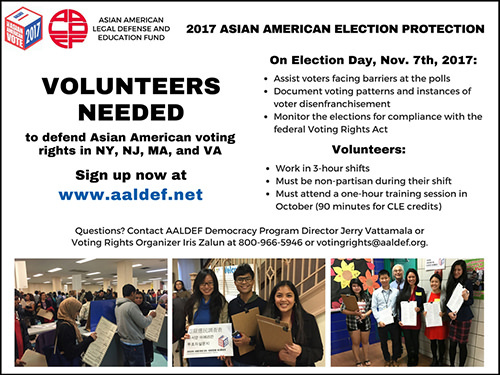 AALDEF seeks volunteers to defend Asian American voting rights in the November 2017 elections in Massachusetts, New Jersey, New York, and Virginia. In past elections, Asian Americans have faced a series of barriers in exercising their right to vote, including segregated “Asian” voting lines. When the news media reported on election results, Asian Americans were overlooked. On November 7, 2017, AALDEF, along with other Asian American groups, will again be monitoring the elections and conducting non-partisan voter surveys at poll sites in Asian American neighborhoods. We need your help. Sign up now at https://www.aaldef.net.